Located right by the sea at Colwell Bay, near Freshwater in West Wight. Nearby are the towns, beaches and attractions of Yarmouth, Totland Bay, Alum Bay and the Needles rocks and lighthouse. Our two bedroom bungalow has one double bedroom, one twin (bunk bed) bedroom, and a sofa bed in the living room sleeping up to a maximum of 6 self catering guests. The modern bathroom has a shower. The modern kitchen is fully equipped with a Cooker, Hob, Fridge, Dishwasher, Kettle, Toaster and Microwave along with ample pots, pans, cutlery etc. Our Isle of Wight Self Catering bungalow has full gas central heating, essential for any out of season breaks. ALL Gas and Electricity is included in the self catering rental price. Directly outside the front of the bungalow is a patio area with table and chairs and lawns for sitting out and enjoying a summer evening’s barbecue after a day on the beach or visiting one of the Isle of Wight's many attractions. Ample free car parking is available to the front of the bungalow. 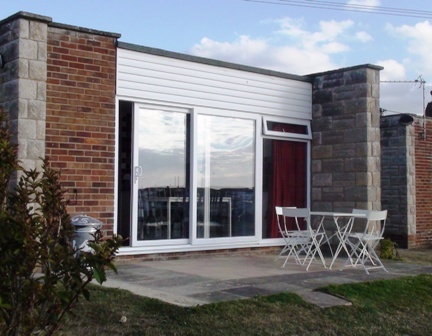 Brambles Chine is set on a self catering holiday village known as Linstone Chine. Linstone Chine holiday village is privately owned and run by a committee of the chalet owners. It overlooks the sea at the quieter, prettiest and unspoiled western end of the Isle of Wight, known as West Wight. Extensive views of the Solent and English Channel to the Needles rocks and lighthouse to the West, along the Dorset and Hampshire coasts to Hurst Castle, can be enjoyed throughout the holiday village, together with spectacular sunsets all year round. Colwell Bay has a gently sloping, child friendly sandy beach with crystal clear bathing at one end, through to a pebbly beach with plenty of rock pools for crabbing at the other. Offering something for everyone, including water sports enthusiasts. Linstone Chine is less than 2 miles away and within walking or easy cycling distance from the small and pretty harbour town of Yarmouth. 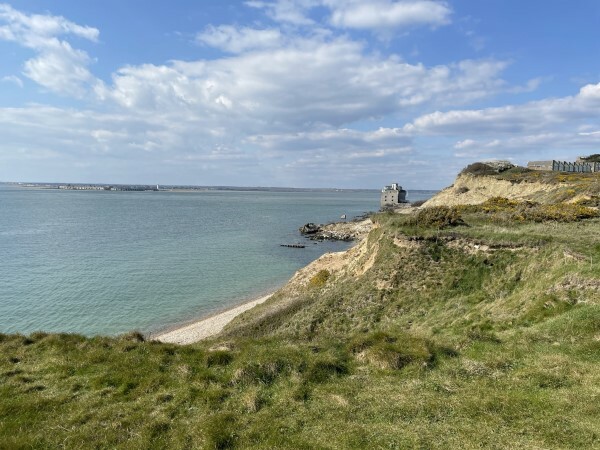 A very pleasant walk with some spectacular views can be enjoyed from Yarmouth harbour, along the coast path, past Fort Victoria Country Park and up to Brambles Chine. Yarmouth is where the Wightlink car and passenger ferry crosses from Lymington on the mainland, or if you prefer to cross from Southampton to Cowes then it is less than half an hour drive across the island to the Red Funnel ferry at East Cowes. The holiday site includes a launderette, shop, crazy golf, 9-hole pitch and putt golf course, a large recreation area with goal posts and a children's play area. Making it a great holiday destination for kids of all ages. With the Isle of Wight measuring 23 miles West to East and 13 miles North to South, all of the Isle of Wight attractions are all within easy reach by car or bus from Brambles Chine. For those wishing to leave the car behind, the bus stop at the end of the lane is serviced by both the number 7 to/from Yarmouth and Newport and also the open top (in the summer) Needles Breezer. Multi-day tickets can be purchased giving unlimited travel. There are also many walks and cycle routes, the Isle of Wight coastal path even passes through the Brambles Chine holiday village. 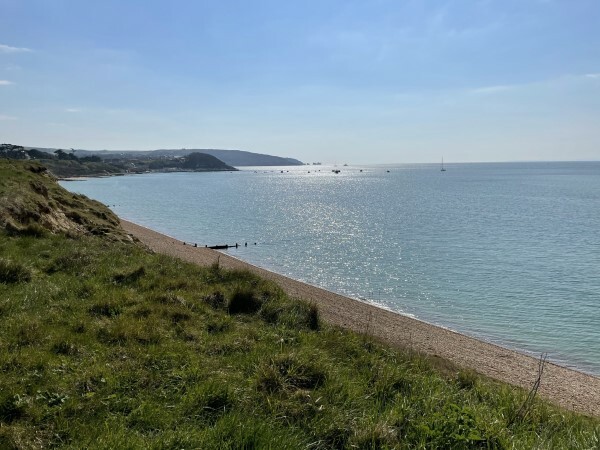 Walking directly from the bungalow, it is possible to walk via Totland and across Headon Warren to Alum Bay and the Needles, then back via Tennyson Downs and Freshwater. Or walking to the East via Yarmouth, Bouldnor to the Hampstead Heritage Coast, then back via Shalfleet, Ningwood and Wellow. Please see our availability page for pricing, availability and to book your 2019 Isle of Wight self catering holiday at Brambles Chine. (Midweek and Weekend breaks may also be available outside of peak times, please ask for details). Please email us via our contact page with any questions or for further information on our Isle of Wight Self Catering holiday accommodation. The Isle of Wight is pronounced and often misspelled "The Isle of White", also often shortened to IOW.